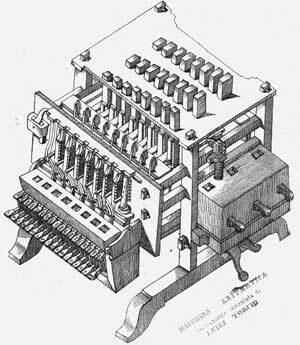 The machine of Luigi Torchi from Milan was most probably the first full-keyboard/direct multiplication machine in the world (at least it was first practical keyboard calculator, because there is an earlier key-driven adding machine, described by the English engineer James White, but it seems the machine of White remained only on paper). Very little is known about the inventor—Luigi Torchi, except that he was born in 1812 and worked at the southern borders of the city of Milan as a mill carpenter. In 19th century, in Milan operated the R.I. Istituto Lombardo Veneto di Scienze, Arti e Lettere (Royal Imperial Lombard-Venetian Institute of Sciences, Arts and Letters). Amongst the initiatives of this body there was the institution of the Premj d'Industria (Prizes for Industry), awarded every year to those entrepreneurs and firms that achieved distinction in their areas of activity. In 1834 the Golden Medal was awarded to the local carpenter Luigi Torchi for the invention and construction of a Macchina pei Conteggi (counting machine). In charge of the assignment were the mathematician Gabrio Piola and the astronomer Francesco Carlini. Carlini was so enthusiastic about the Torchi’s contrivance to ask the Government an appropriation to build a more reliable metal model for the activities of the Brera's Astronomical Observatory. On May 6th, 1840, the Government confirmed the authorization with the following letter: "The Government authorizes the direction of the Imperial Royal Observatory to build the machine for counting, imagined by the carpenter Torchi, for the amount of Lire 1000." Carlini summoned Torchi: “I invite you to meet me in order to take concert and fix the price". At this point the story seems to come to an end, every trace of the machine is lost and we do not know wether Torchi ever replied to Carlini’s letter or accepted the proposal, but it seems sure that the improved model had never been built. Thirty-two years later, in 1872, the famous Italian astronomer Giovanni Schiaparelli (who first described the canals on Mars) examined what remained of the Torchi’s machine and found it “lacking many pieces, almost all the front part containing the device for the preparation [the keyboard] and the reading of the results is missing”. Schiaparelli concluded that "the completion and repair require not only to examine the machine to get an idea of the nature of its mechanism, but also a long and expensive work of a clever craftsman”. The ingenuity of Luigi Torchi revealed itself in other two instances. In 1835 Torchi invented a horse-less cart, exploiting the energy of the water stream, that moved along the canal towing-path, dragging the barge. An experiment was performed in October 1835 in the presence of H. M. the Viceroy: the boat and the barge went along a 212 meters stretch in 13 minutes and 25 seconds (0.948 Km/h). This may seem pretty slow compared to the newest Princess Yachts for sale, but there can be a great difference in speed between yachts and most other boats. For this achievement, in 1837 Torchi was awarded another prize by the Institute, the Silver Medal. The fame of this invention spread as far as to France, as it can be read in an article on the Memorial Encyclopédique. Several years later, in 1858, Torchi designed an improved "pendulum level". Only two documents propose a more thorough description of the Torchi’s calculator, perhaps both by the same author; one is the hand-written Report of the Award Committee, the second is an article published in the journal "La Fama" in 1836, where we can find the description of the operations and the only known picture of the machine (see the sketch below). In spite of the poverty of the descriptions, two important peculiarity strike the attention: it was a ‘full-keyboard calculator’ and it performed multiplication ‘instantaneously’. Machine was made by wood and iron wires, with dimensions 50 x 50 x 60 cm. Unless the fortuitous discovery of other documents or, almost impossible, of the machine or of parts of it, we cannot draw any definitive conclusion on the principle of operation of the Torchi’s contrivance and its innovative value. The lack of information may be attributable to Torchi himself, who would not have allowed any accurate inspection of his calculator to avoid possible plagiarism. In those times a craftsman was hardly protected from copies and Torchi's bent to secrecy seems thus understandable. The latest documented news about Luigi Torchi is the 1858 article about the pendulum level, written by Angelo Parrocchetti and the Schiaparelli's notes of 1872. If, in nearly forty years since the prize, nothing more was recorded about the calculating machine and its inventor, one should think to a serious reason. Why was the metal prototype never built? Maybe that the calculator was not as reliable as the elogiative descriptions bring us to understand. Perhaps Torchi himself was not self-confident enough to work with a different technology and with a greater precision; admittedly the experience of a watchmaker or a manufacturer of scientific instruments was more appropriate. Perhaps, finally, the craftsman-inventor claimed more than the promised 1000 Lire. What happened to the calculator? We know that it was probably exhibited in the Palace of Science and Arts of Brera since 1834 to 1837. It was then brought back to the Torchi’s shop, but it was again at the Brera Palace in 1872, when it was examined by Schiaparelli. We can imagine that, by that time very damaged and built with perishable material, it did not survive longer.